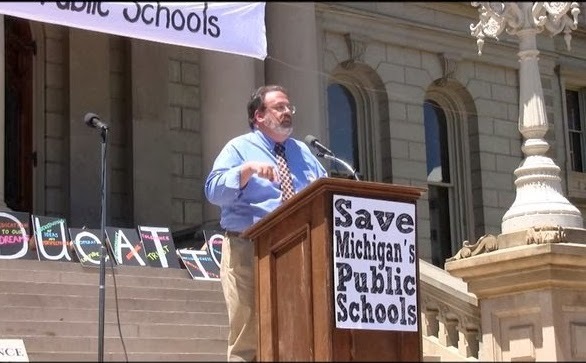 Steven Norton, executive director of Parents Across America affiliate Michigan Parents for Schools, and member of the PAA Board of Directors, was the 2014 recipient of the David McMahon Human Rights Award given by the Michigan Education Association. The McMahon award is given annually to recognize "individuals or groups outside the MEA which distinguish themselves by courageously accepting the challenge of moral and ethical leadership in the field of human and civil rights." In presenting the award on 25 April, Ann Arbor Education Association president Linda Carter said: "Steven Norton believes that every child deserves to develop as fully as possible, and for him, a quality education is central to that effort.... He's fought for those convictions at the state Capitol, at PTO meetings, and on [the MIPFS] website." Carter concluded by saying, "His own children are a reminder of why he's so involved in the support of public education. His efforts to build bridges and alliances, to make sure public education is supported and valued, and to involve parents in every child's education are challenges Steven Norton accepts as a leader in the field of human and civil rights." Norton accepted the award on behalf of all his colleagues who have worked to make Michigan Parents for Schools an effective voice for parents to support and defend strong, community-governed public education.